The focus of this workshop is making cards and other larger pieces suitable for framing and gift giving. All pieces made in the workshop will have a summer theme using pressed petals and leaves. You will learn how to press the botanicals and apply them to a heavy card stock. Your creations will be lovely gifts or wonderful pieces to treasure yourself. Supplies include an abundance of pressed botanicals, cards and paper. Other colors will also be available to make your works of art. Teaching Artist Anna Sidorow works in mixed media: collage, printing, painting and primarily creates small works of art. Her paintings are semi-abstract, and more than just the subject, the colors, shapes, movement and the paint itself gives the image a strong visual aesthetic. 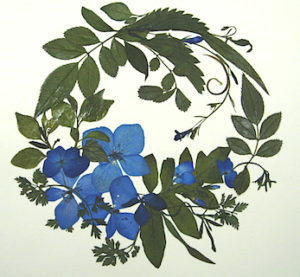 She uses pressed botanicals in her collaged note cards – every petal, leaf and stem has been picked and pressed by her. She has been experimenting with marbling paper and monotype printing, using gelatin as the plate surface. Anna has participated in numerous art shows and exhibits her work at Spectrum Gallery. Please bring the Material Fee ($10) to the Workshop and pay directly to the Teacher. Thank you!